Watching movies in cinemas these days can thrilling, especially if you take into cognizance the kind of equipment utilized in these cinemas. It’s very romantic taking your loved ones to the cinema because it affords you all the opportunity of strengthening existing bonds. You may want have that quiet, cozy time with loved ones but that can’t really be done at the movie theater. That’s the more reason you should consider setting up you own cinema at home because it affords you the opportunity of watching your favorite movies amongst the people you care about. We all know setting up a private cinema involves cost, but if you must do it, try to at least to get it right the first time. When you examine the kind of walls found in theatres, you’ll discover that they are mainly covered with fancy indoor/outdoor carpets and they are placed on acoustic boards which aren’t a common feature in most homes. You can visit any home improvement store around you to get an estimate on the lightweight acoustic board, and then factor in the cost of the indoor carpet as well as installation cost, of which you’ll be need an experienced carpenter to execute. Our major intention is to make our homes resemble a modern day movie theatre. You should be able to get execute this stage under $500. Don’t underestimate the psychological impact the ceiling can exact when watching movies. You need it to be as real it can be. Most cinemas have fiberglass panels, which add to the aesthetics of their auditorium. Some homes don’t have high ceilings, which is important if you want to add a dropped ceiling to your cinema room. Those with high ceilings can install inexpensive fiberglass insulation and then create a dropped ceiling which must be covered with fiberglass to make it as realistic as possible. Install the necessary hardware such as wiring for the light, speakers and your mini LED projector. The cost of this installation can vary between $200 and $400. It all depends on the size of your ceiling. 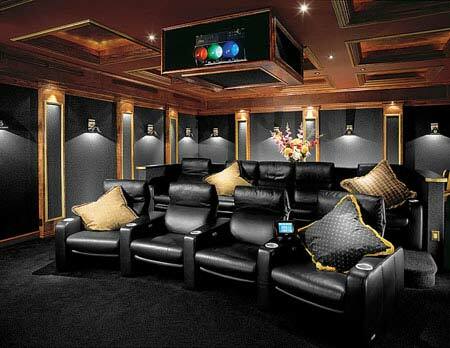 Lighting and furnishing is one of the most important factors to consider when setting up a home movie theatre. Lighting should be excellent as it is one of the best selling points of public cinemas. Your home furnishing should also resemble, to an extent, what you’d find in movie theatres. Pay attention to sitting plan to ensure that there is nothing obstructing the viewer from relieving the cinematic experience in your home cinema. Try to acquire the kind of seats you’d find in cinemas, not just the normal living room couch. Most cinemas use colors that help reduce reflections as well as create the impression of a bigger auditorium. You may want to consider using colors similar to what you’d find in modern cinemas as this will contribute significantly to your viewers’ experience. It doesn’t cost much to get the right colors in the right places. Most people are torn between using 3D TV or HD projector. Of course, both are great but the former is a lot more expensive to acquire. Many people use cheap projectors such as Megoodo Led Mini Projector, HTP LED-33, Fugetek FG-637 and a lot more when starting out. But they more powerful projectors such as Sony VPL-VW300ES, BenQ W1070+, Epson EH-LS1000 and many more. All these selections largely depend on the depths of your pockets. I personally started with Megoodo Led Mini Projector before dropping it for BenQW1070. It’s definitely not easy setting up your person home cinema, because it involves lots of time, money and other resources. You can comfortably set up your own home cinema with a budget of $2000 to $3000. Everything boils down to what your pockets can afford. 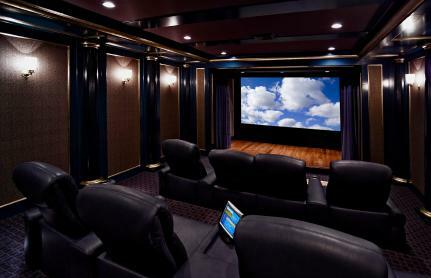 People who have installed theirs know the real value of relieving the cinematic experience with those they care about.